Reroll markers are slightly frivolous addition to a team but many Skaven characters come with pretty cool back banners that seem a shame to waste (given they would not be making an appearance on the actual models). A bits box rummage also turned up a couple of goblin bad moon icons so they too are represented in the teams reroll markers. I simply mounted the markers to 25mm bases (usually pinning them) and made a little heap of modelling putty around the base for support, pressing numerous skulls into the putty before it dried. I used randomly broken slices of cork from a wine bottle to pave the base – the intention being that the team will be on dungeon/cave style bases. Small rubble scatter and sand was then glued around the skulls and here and there over the base surface. 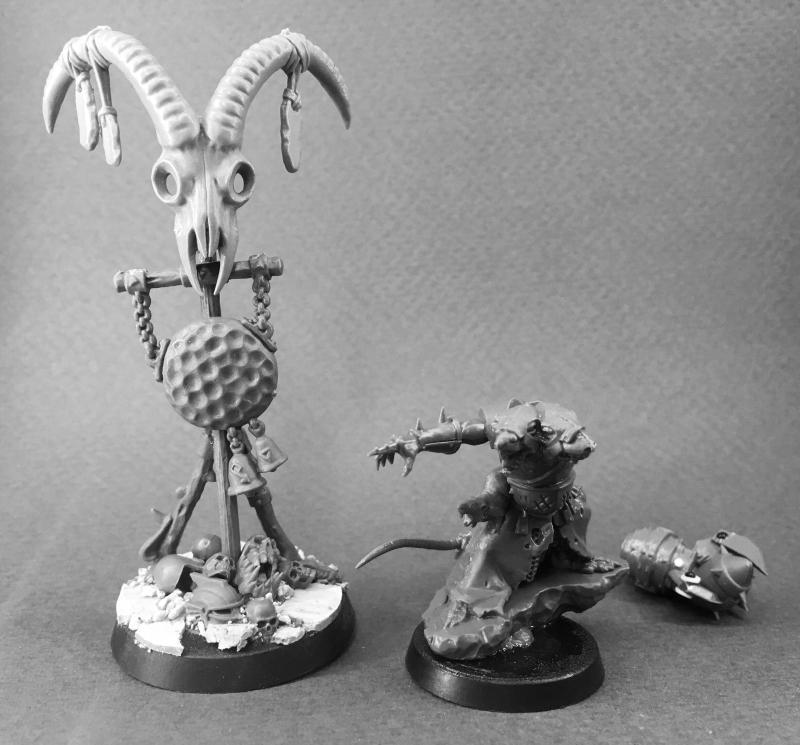 I fashioned a bigger marker – either a turn marker or score marker, most likely – from three banner poles, a Skaven gong and the big horned skull from (I think) an Ogre banner. 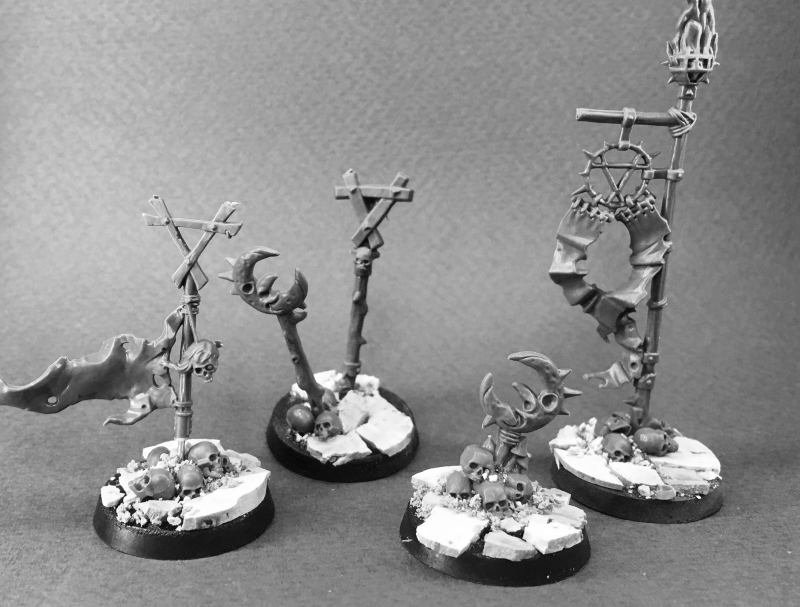 The dangling bits of stone will make fine Warpstone shards, I think. The base was completed in much the same way, except with a variety of skulls and blood bowl helmets heaped at the bottom. The WIP thrower snuck in to this photo (here with his “two heads” mutation option). 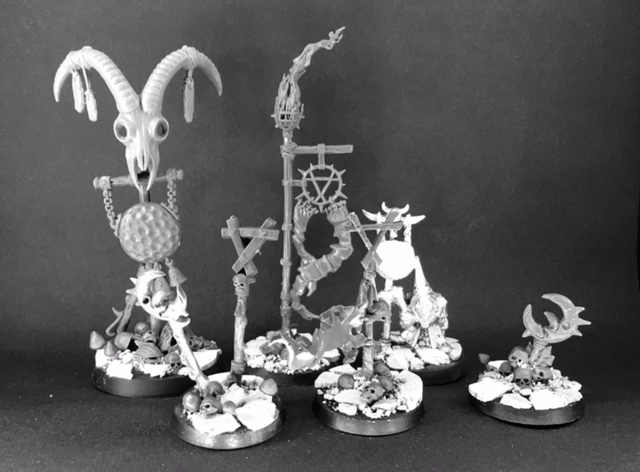 No Warhammer cave dwelling models would be complete without some cave fungus! These are small lengths of wire or plasticard rod with a cap “sculpted” from modelling putty. I say “sculpted” but all it needs is to dip the tip of the toadstool shaft into superglue, push a small ball of putty on top then shape it into a rough rounded cone with moist thumb and finger. I do all this with a row of toadstools glued to a strip of card. Once dry a small hole is drilled into the base and the fungus is superglued in. An old night goblin musician rounds out the markers giving me a set of 4 rerolls, 1 turn a 1 score marker. Happy days.